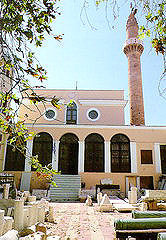 The Byzantine Museum in Chios is contained within the 19th Century Ottoman mosque which is located in the central town square. This museum has been in operation since 1980 and contains items that were donated from collections as well as findings discovered in local excavations. The dates of the items on display range from the Early Christian period to the post-Byzantine period (5th - 18th century). The museum is comprised of a timber-roofed porch, a large basement and a main room. Currently, the mosque porch and the courtyard are only open to the public. The remaining portion is still under renovation. The courtyard displays stone objects discovered during excavations as well as tombstones from Muslim and Jewish graves. There is a significant collection of sculptures dated during the Genoese occupation of Chios between 1345 - 1566 which serves as evidence of the period. Worthwhile items included in this collection are the sarcophagus of Ottuboni Ioustiniani located in the courtyard next to the stairway as well as two large slabs from lintels with carvings of Aghios Georghios (St. George) slaying a dragon displayed on the porch. At least one item was brought from Genoa.